However, one driver seemed to have realised too late that he took the wrong route and when he attempted to turn back to Walvis Bay his vehicle got stuck in the loose sand next to the road. 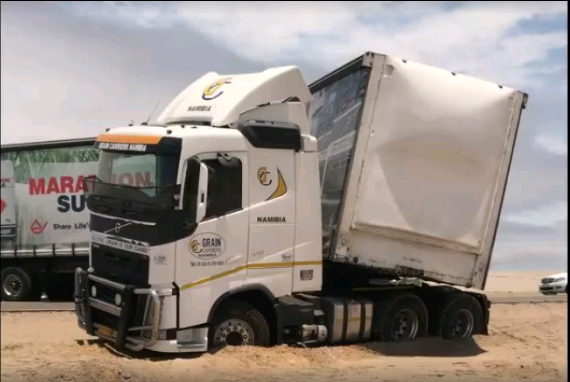 The unfortunate driver from Grain Carriers Namibia had to call in the help of a heavy recovery vehicle from Walvis Bay to free his vehicle from the sand. 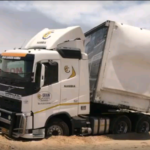 The truck blocked the busy B2 road for quite some time and traffic had to be directed past the heavy vehicle while it was towed out of the sand and back onto the tarred road. As per the directive of the Minister Works and Transport, John Mutorwa, larger trucks is required to make use of the C14/C34 behind the dune belt to move between the two coastal towns as an alternative route to avoid road congestion and unnecessary motor vehicle crashes during the Festive Season. The B2 coastal road is one of the busiest roads in the country during the Festive Season because thousands of motorists travel on the road each day. The new Dunes Mall at Walvis Bay will be a big attraction for holiday makers as a lot of Christmas shopping still needs to be done.